Series 165 PRECISOR® II Pneumatic and Electro-Pneumatic Positioners deliver stable process control at an exceptionally low price. Its rugged, durable design makes it ideal for harsh environments while maintaining precise, accurate positioning of the control element. Units can be easily changed from direct to reverse action, or vice versa. Low air consumption keeps operating costs at a minimum, while still responding quickly and accurately. Excellent for use in chemical processing, food and beverage, pulp and paper, and pharmaceutical industries as well as many others. 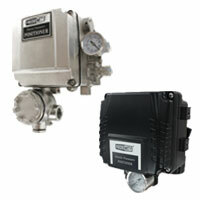 Series 165 Precisor® II Pneumatic and Electro-Pneumatic Positioners provide excellent modulating control when used between the Dwyer Temperature Controllers, Current to Pressure Transducer and the Hi-Flow™ Valve in such industries as the food and beverage processing, chemical, pharmaceutical, and wood pulp and paper. Pneumatic: 3 to 15 psig (0.2 to 1 bar); Electro-Pneumatic: 4-20 mA DC. (165EL only): 250 ±15 Ω. 20 to 101 psig (1.4 to 7.0 bar). 0.10 scfm (3 LPM) at 20 psig (1.4 bar) supply. 28 scfm (80 LPM) at 20 psig (1.4 bar) supply. 0.5 to 6" (10 to 150 mm). Aluminum: -4 to 158°F (-20 to 70°C); SS: -40 to 158°F (-40 to 70°C). 165NL: 3.1 lb (1.7 kg); 165EL: 6.1 lb (2.7 kg). 1. Select Model No. to specify input control signal. • Field selectable cam for direct or reverse acting. Valve Mount: For factory mounting and calibration to Hi-Flow™ control valves, add suffix to valve model number of positioner. Consult factory for pricing.